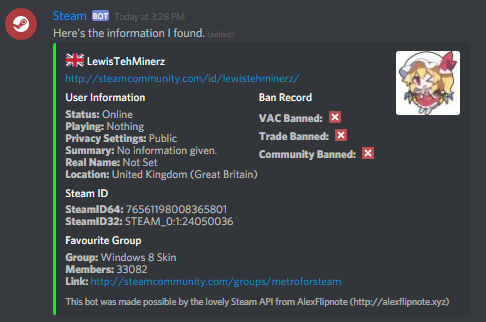 Steam is a profile search bot for Discord. It allows users to search their Steam profiles (or others) without leaving their client. With detailed information, it provides a sleek display of the results. Run steam help for help. The API with Steam is a bit weird at times, however an issue hasn't arisen for some time now. There is a ratelimit so that you can only do 5 requests a minute. The old Steam syntax is now deprecated. You will be given instructions on how to use the new version of the bot.